Skechers USA has begun work on an expansion to its corporate headquarters in California which, according to the company, is evidence of its commitment to global growth and its hometown community. This project will greatly increase Skecher’s office, design and showroom space to more than 30,658 square metres (330,000 square feet). At the centre of the new complex will be a design centre covering more than 9,290 square metres (100,000-square-feet). New executive offices are also being built on Pacific Coast Highway in Hermosa Beach. The existing building at 330 South Sepulveda Boulevard will also be expanded, and a new office is to be opened across the street in Manhattan Beach. Skechers has the goal of achieving the sustainability LEED Gold certification for each building. Features planned will include solar panels, daylight harvesting and motion-controlled lighting, in addition to high-performance glass, R30 insulation and Forest Stewardship-certified wood. Through careful landscaping, the company aims to utilise drought-tolerant bio-filtration planters with low-water-use plumbing and irrigation. Completion of the building work is anticipated for 2022, to mark the celebration of Skechers’ 30th anniversary. 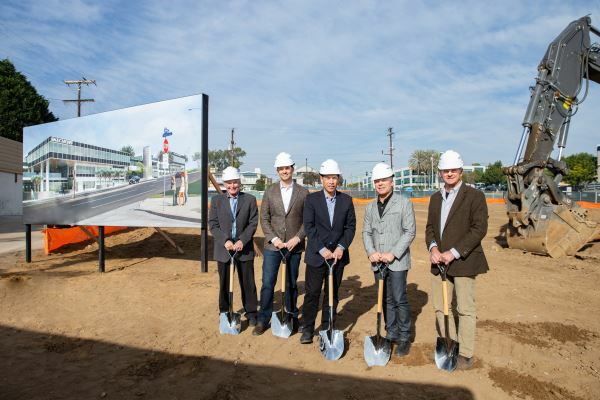 The photograph above shows ground being broken on Skechers corporate headquarters expansion – from left: chief operating officer David Weinberg, chief financial officer John Vandemore, senior vice president of real estate and construction Peter Mow, Skechers president Michael Greenberg and vice president of commercial development Tim Ball.